There is no doubt that iPhone is still one of the best mobile devices. Millions of people have been deeply impressed by its high-end design and creditable quality. However, every bean has its black. iPhone’s iOS is a tightly closed system which has undeniably caused lots of inconvenience to extensive users. For instance, if you want to transfer ringtone to iPhone or transfer some movies to your iPhone, you have to draw support from additional tools such as iTunes rather than directly transfer them to iPhone with USB cable just like Android. But iTunes is a complicated tool for many users particularly for newbies. Luckily, here’re several easy ways which can help you transfer movies to iPhone without iTunes so that you can enjoy spectacular blockbusters on your iPhone at will. This phone manager is very professional as it can help you view, manage, transfer, backup and restore iPhone data on PC. So you can use it to transfer movie to iPhone. Follow the steps below and you’ll make it. You can search this tool on Google Chrome or directly click the button here to download and install it on PC. Please make sure you’ve installed iTunes on PC. But you don’t have to run iTunes when using this manager. Run this phone manager and connect iPhone to PC with attached USB cable. At this moment, your iPhone screen may appear a pop-up window. Click “Trust” and iPhone will be connected to PC successfully. Click the “Videos” icon on the top and then “Movies” > “Import”. Then you can select movies from computer. Tap “Open” and they will be transferred to your iPhone very soon. This phone manager requires USB cable. Sometimes, your USB may be broken or not at hand. Then how to transfer movies to iPhone without USB? Now, the two methods below will help you out. AirMore is a wireless transfer tool for iPhone and Android. With it, you can transfer data from PC to iPhone including music, photos, videos and documents wirelessly and vice versa. Search it on “App Store” or click this button to download and install it on iPhone. 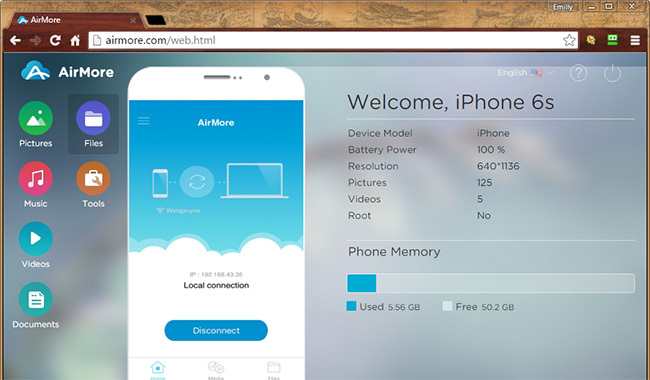 On Google Chrome, Firefox or Safari, go to AirMore Web page by visiting “airmore.net“. Then a QR code will appear on the PC screen. Run AirMore on iPhone and tap “Scan to connect” to scan the QR. In order to connect successfully, please set up your iPhone and PC in the same WIFI network. Once connected, your iPhone information will show up on the web page. 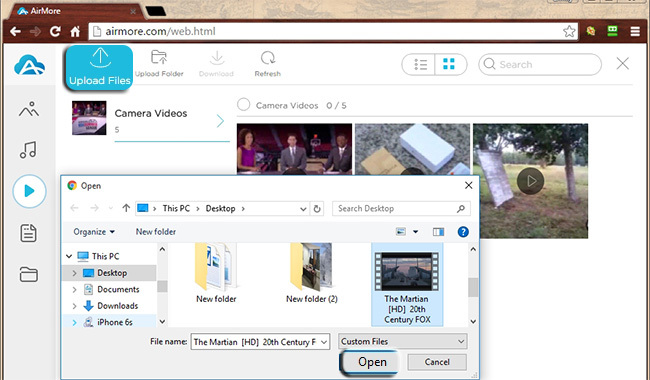 Click “Videos” icon on the left pane and “Upload Files” on the top. Then you can select movies from PC. Items will be uploaded to your iPhone swiftly provided that your network is very smooth. Tips: Due to the limitation of iPhone, you may not find the transferred movie on your default Videos list. You can seek it out from “Media” in AirMore. No need for USB cable. OneDrive is a cloud storage tool developed by Microsoft. It’s very useful. On the one hand, it can transfer your camera roll to cloud automatically so that you will never lose photos any more. On the other hand, it’s also a nice wireless transfer tool. Let’s see how to transfer movies from PC to iPhone with OneDrive. 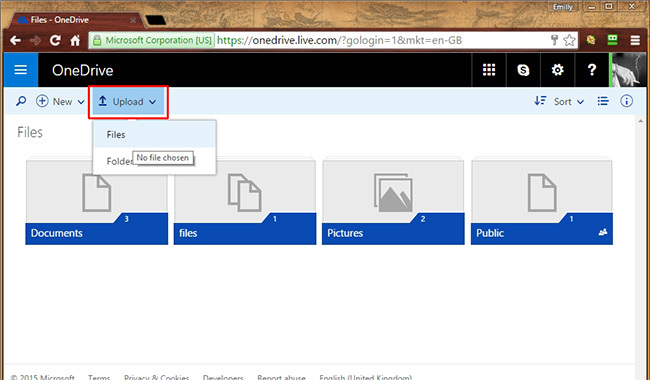 On PC, go to OneDrive by visiting “onedrive.live.com” and then login into your account. 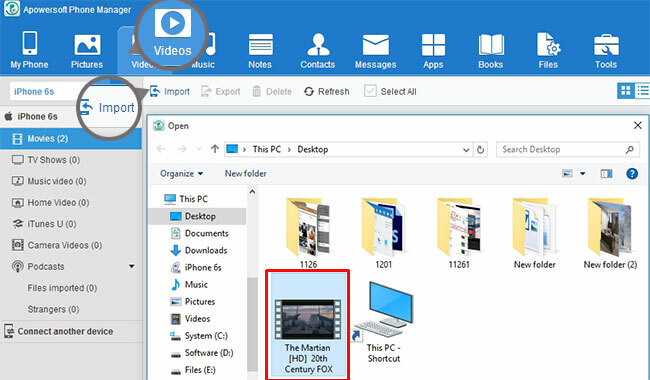 Click the “Upload” button on the top or directly drag a movie from your computer. It will be done within minutes if your network is great. In fact, it also depends on the size of your file. Download and install OneDrive on iPhone and login into the same account. Then you’ll see the thumbnail of your movie. Tap it and you can enjoy the movie on your iPhone. 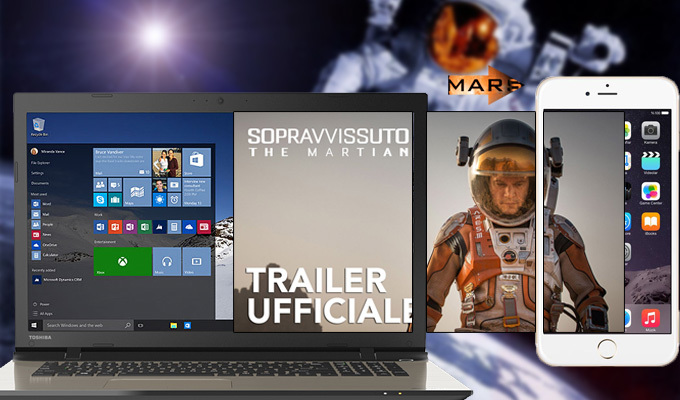 As long as you have an OneDrive account, you can enjoy your movie everywhere. And it doesn’t take up your phone memory. Your PC should have smooth network connection, or it may take you hours to transfer a 2 GB movie to OneDrive. What’s more, in order to enjoy the uploaded movie on iPhone, you have to connect iPhone to a strong and stable Wi-Fi. All the three methods above can help you transfer movies to iPhone without iTunes. Both AirMore and OneDrive allow you to transfer movies wirelessly. But they require a pretty smooth network. On the contrary, with Apowersoft Phone Manager, you can transfer movies from computer to iPhone promptly even if there is no network connection. Therefore, this phone manager may be your ideal choice. Rating: 4.2 / 5 (based on 24 ratings) Thanks for your rating!